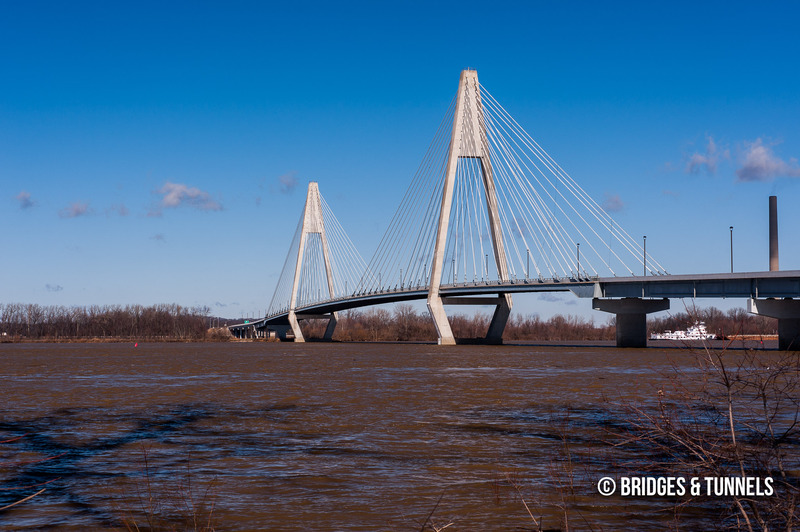 Planning for a second Ohio River crossing at Owensboro began in January 1987 with Green River Area Development District (GRADD) recommending that a crossing be constructed near Maceo, east of Owensboro. 1 In April 1988, U.S. Representative William H. Natcher announced that he and U.S. Senator Wendell Ford would seek federal money to help pay for the proposed span, which would connect Daviess County and Owensboro in Kentucky to Interstate 64 in Indiana. The Ohio River and associated floodplain at the proposed bridge site was 3.97 miles wide. In June, $3.6 million was secured for preliminary planning for the new bridge. 1 The U.S. House of Representatives approved $5 million for a final design, right-of-way acquisitions and utility relocations in June 1989. During this time, improvements to US 231 from the Ohio River bridge north to Interstate 64 were discussed. 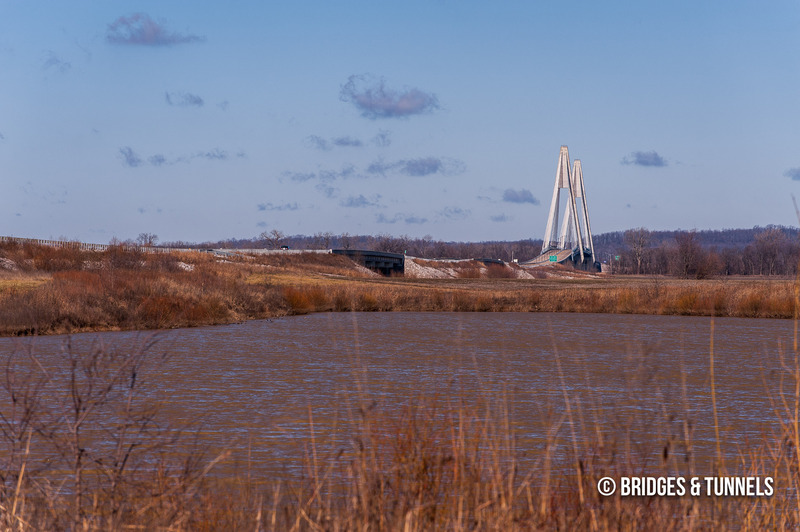 In August, Daviess County Judge-Executive Bill Froehlich suggested naming the bridge after Natcher for his contributions towards the development of the span. Kentucky Transportation Cabinet (KYTC) Secretary Milo Bryant announced that the proposed Natcher Bridge would be the state’s top priority in May 1990. 1 In May 1991, the Indiana Department of Transportation (INDOT) stated that it was committed to widening US 231 from the bridge north to Interstate 64 to a four-lane controlled access highway. Kentucky, meanwhile, budgeted $32 million for approach ramps and improvements to US 231 and US 60. Kentucky Governor Brereton Jones named the future bridge the William H. Natcher Bridge during a public ceremony at Owensboro’s RiverPark Center in December 1993. 1 Construction, however, would not begin until 1996 due to federal funding issues. Design and construction monies totaling $23.3 million was requested in January 1994 by U.S. Representative Lee Hamilton for US 231 in Indiana. On March 29, William H. Natcher, who served the House for 40 years, passed away. 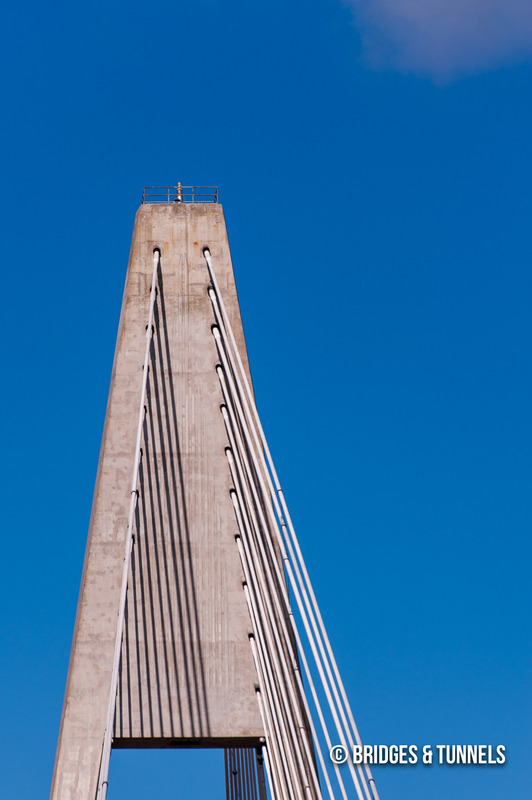 The design of the span, completed by Parsons Brinckerhoff Quade & Douglas, Inc., included two identical concrete towers, diamond shaped to improve torsional stiffness of the superstructure, that would rise 374 feet. 3 Each tower was designed with two hollow inclined legs that met at the top, where the stressing ends of the cables would be anchored. Below the deck, the tower legs bend inward, held in place with a post-tensioned concrete tie beam. The superstructure was designed with steel girders and floor beams made composite with the concrete deck slab. The deck consisted of 230 mm thick precast concrete slab panels with a central beam to control torsion, and a 38 mm latex modified concrete overlay was poured on the deck slab. Ninety-six stay cables were designed into the bridge, each made of 15 mm diameter seven wire strands, with cross ties that would prevent galloping. 3 The cables were greased and sheathed grouted in coextruded pipe. The construction of the towers. The first superstructure segment constructed at the tower, supported by temporary bracing. The remaining superstructure segments constructed and cables installed sequentially on alternate sides of the tower until connections are made at the pier and mid-span. Each steel frame is lifted by a barge mounted crane and are field spliced to the edge girder that was installed previously. Two stay cables connecting the steel frame to the tower are installed and tensioned to a predetermined initial length. The six precast deck panels are installed and cast-in-place concrete closure strips are placed between them and the edge girders of the previously installed segment. The two cables are tensioned to their final length. Kentucky Governor Paul Patton, who succeeded Brereton Jones, requested matching funding: the state would input $30 million if the federal government would front $25 million. 1 In October 1996, U.S. Transportation Secretary Federico Pena announced that the federal government would earmark $7.4 million for the span. This was followed up with an additional $12.6 million in federal funds for the bridge in June 1997. The state, as a result, pledged the remaining $30 million and major construction for the bridge was cleared. In October, Traylor Bros. of Evansville, Indiana was awarded a $55.5 million contract to construct a 4,505-foot cable-stayed bridge. 1 Construction began in January 1998. In June, construction on several piers were underway on the Kentucky side of the approach span. A 6.4-mile four-lane relocation of US 60 east of Owensboro was opened to traffic in August at a cost of $20 million. 1 By this point, two central A-frame towers were being constructed and by December, they were at the height of the bridge deck. By May 1999, the bridge was 35% complete and ahead of schedule. By September, it was half finished and 16 of the 17 bridge substructures were under construction. 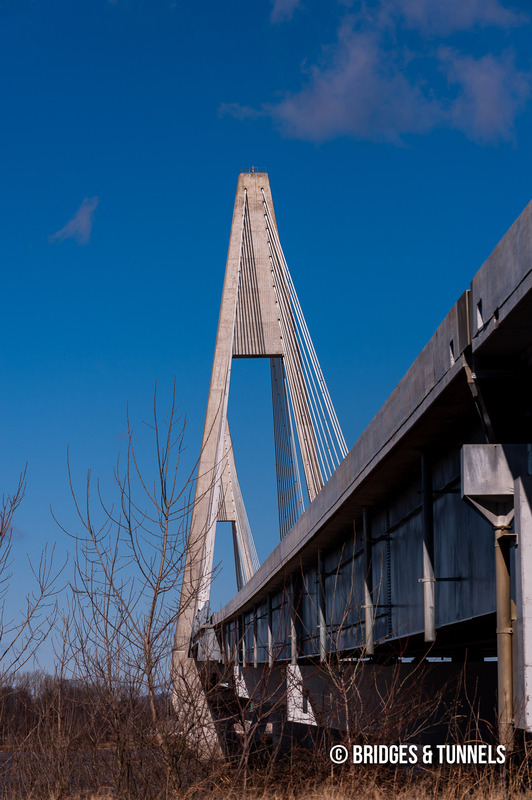 1 Traylor Bros. announced in December that the bridge would not be finished until mid-2002, two years later than expected, due to weather and the complexity of working with the cables. 2 Curing of the concrete was faster than expected due to ice being trucked in and circulating cold water from the Ohio River through the structure. The A-frame tower closest to Kentucky was complete and the first two of 24 sets of cables were connected by December 2001. 1 Only three additional deck sections remained to be installed, which included the final 30-foot section in the middle of the span. 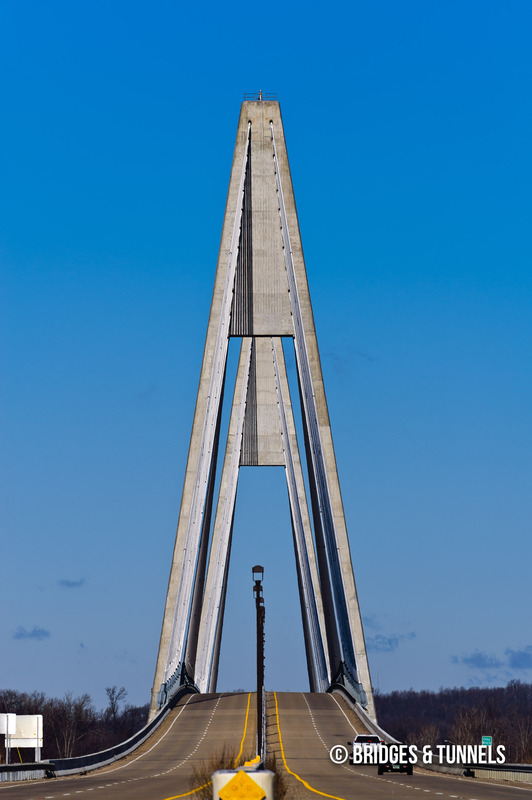 It was installed in February 2002, when the last bridge deck, measuring 30-feet long and 70-feet wide, was installed. It was adorned with a pine tree, an American flag and a bright orange Ironworkers Local 103 banner. After four years and ten months of construction, the Natcher Bridge, carrying US 231 over the Ohio River, opened to traffic on October 22, 2002 at a cost of over $57 million. 1 In total, $70 million was spent that involved the construction of an approach to the bridge on the Kentucky side. US 231 through the city of Owensboro, including the Owensboro Bridge, was renumbered to KY 2155, and the former routing of the highway in Indiana was renumbered to IN 161. “William H. Natcher Bridge timeline.” Messenger-Inquirer [Owensboro]. 30 August 2002. 24 February 2004. Weeks, John A., III. “William H. Natcher Bridge.” Highways, Byways, And Bridge Photography. N.p.,2012. Web. 14 Feb. 2012. Chandra, Vijay, P.E., Steve Goodpastor, P.E., and Ruchu Hsu, P.E. 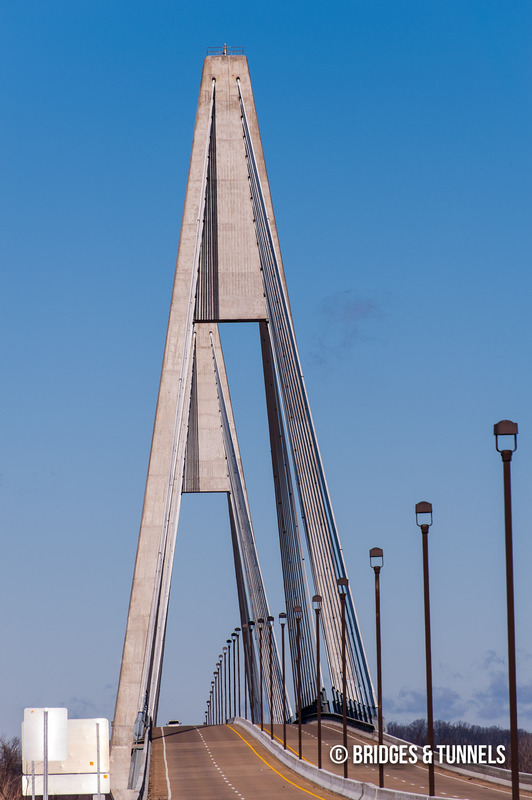 The William H. Natcher Cable-Stayed Bridge at Owensboro, Kentucky. N.p. : n.p., 2002. Transportation Research Board. Web. 15 Feb. 2012.